Alopecia in pets is a common reason for consultation. As all conditions affecting the skin, hair loss is usually striking and causes discomfort to pet owners, not only due to cosmetic reasons but also due to the consequences on their pets health. 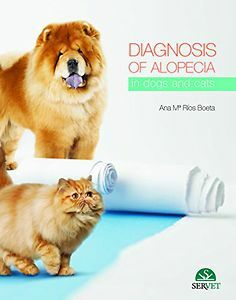 This book is intended as a highly visual guide on how to diagnose alopecia in dogs and cats, in a structured and methodical manner, based on the distribution pattern and lesions. The large number of images, diagrams, tables and drawings, coupled with clear and practical descriptions, will allow readers to make the most of this work in day-to-day dermatology consultations.